I wanted to do a mock draft with the quarterbacks falling. I don’t think it’s an unrealistic proposition, as discussed in yesterday’s piece. People will instantly point to this being a ‘quarterback driven league’ but there are enough question marks this year to consider the possibility we won’t see a quarterback in the top-10 for the first time since 2000. As for the Seahawks – well we know they can be a tough team to work out. They’ve targeted pretty obvious needs the last two years, but the players they’ve drafted have been anything but obvious. I’ve given them Cordarrelle Patterson this time , a player with ideal size for a receiver with explosive playmaking qualities. He can get downfield, he’s useful on reverses and running plays and he’s a great return guy. He’s a home run hitter. The big issue is he’s a ‘one or two big plays a game’ type. He’s not a ten catch player who churns out 100 yards regularly. Patterson has also had sloppy moments this year such as giving up on a pick-six against Akron and dropping an easy downfield pass against Georgia. If the Seahawks want a consistent target who can make multiple small plays in a game, chipping away at a defense, this isn’t the guy. But the way Seattle’s offense is being utilised emphasises the big play and values special teams. They appear to want to run a lot and then hit you on a play action pass downfield. They want an X-Factor in the return game to create field position advantages and score cheap points. In that sense, Patterson fits the bill. And perhaps he can be coached into a more rounded receiver? This is his first year at the FBS level after playing in the JUCO ranks. For what it’s worth, James Carpenter and Bruce Irvin are also former JUCO transfers. Justin Blackmon, Michael Floyd, Kendall Wright, A.J. Jenkins, Brian Quick, Stephen Hill, Alshon Jeffery, Ryan Broyles, Rueben Randle. Out of that group, are any similar to Patterson? Floyd, Quick and Jeffery are both big targets, but without great downfield speed. 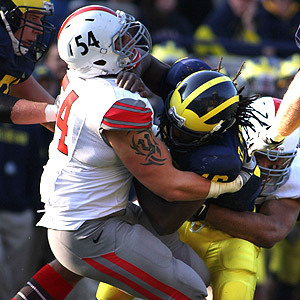 The most similar is perhaps Stephen Hill, but he didn’t make the kind of plays in college we’re seeing from Patterson. If the Seahawks continue to utilise a big play passing game to compliment a featured running attack, Patterson could be a good fit. Particularly given his quality as a return man. Is there a quarterback worthy of this pick? If not, you have to take the best player. Brilliant three technique who plays with intensity every snap. I think he’ll be a consensus high pick by April. Jacksonville needs a pass rusher and Moore has been one of the best in the NCAA this year. He has 10.5 sacks already. The complete cornerback prospect. He can cover, he can play run support, he’s a ball hawk and has elite recovery speed. He’s become a more consistent pass rusher. Has anyone seen a guy like this before? 6-7 but moves with great agility. It’s unlikely he declares as a red shirt sophomore, but if he does – he could be a top ten pick. Elite potential. 6-6, 220lbs. He played well enough against LSU to show he could go this early next April. I’m not convinced he’ll go in the top ten. Huge upside but so inconsistent. The Jets need another pass rusher and Werner could have a big impact in the AFC East. Incredible athlete with untapped potential as a pass rusher. Ogletree could be great. There are some off-field concerns. How do you not take this guy here? He could be the best guard in the NFL in year one. Great player with a few lingering off-field concerns. On the field though he’s a leader and a playmaker. He needs to rebound from two sloppy performances to get back into the top ten. Cooper is only a notch below Warmack. Possibly the most athletic guard you’ll ever scout. He’s expected to have a huge combine. Teams love big, athletic pass rushers. Is Tony Romo getting an extension or not? Jerry Jones loves Arkansas, so this could be the alternative. Incredible safety prospect. Could go much earlier than this. Deserves much more attention. If he drops, it could be painful. Arizona needs to find a left tackle, but they also need to find a long term quarterback. The Seahawks don’t conform and might consider another left field pick. Patterson is a home run hitter. Can he be consistent? He’s had some good games, but he’s a little over rated. This is great value though. Great nose tackle prospect who could go in the top-15. He’s better than Dontari Poe for me. They need a receiver but Banks is a very talented corner – and that’s also a need. He’d be a top-15 pick if it wasn’t for his age. He’s approaching his mid-20’s as a former JUCO transfer. He could go much earlier than this, Mosley’s playing well enough this year to be a top-15 pick. Secondary is a bigger need but the value doesn’t fit here. Hankins is scheme diverse. He’s a better player than this placing. Expect Woods to land on a good team that can look for value. Not the flashiest player but nobody shows more effort. He’d look great in Baltimore. A 6-8 tight end that makes plays and is a red zone threat? Sounds like a first round pick to me. He blocks well too. Williams is the kind of player that belongs on a team with attitude. Thomas was so impressive against South Carolina. He could play tackle or guard. He’s a playmaker and Houston could shoot for value here. Perhaps the most impressive offensive player this year. Drafts that aren’t dominated by quarterbacks are rare. You have to go back to the year 2000 to find one – Chad Pennington was the sole quarterback taken in the first two rounds. He was the 18th overall pick. Next April, we could see a repeat. Such a suggestion is often accompanied by the following counter: “This is a quarterback’s league these days.” While that is evidently true, the 2000 draft wasn’t a review of the times either. Just twelve months previous five quarterbacks were taken in the top twelve picks, including the first three selections. In 1998 we saw Peyton Manning and Ryan Leaf go #1 and #2. Michael Vick was the #1 pick in 2001 while the brilliance of Julius Peppers in 2002 was only good enough to earn the #2 overall pick, sandwiched between David Carr and Joey Harrington – both quarterbacks. Storied USC quarterback but was always likely to face hyper critical analysis by putting a fourth year of tape in the hands of scouts. 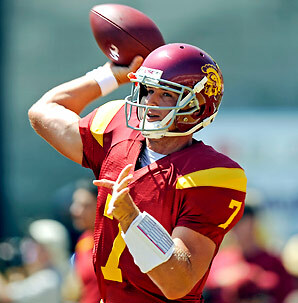 He’d made tangible progress in three years with the Trojans and peaked at the end of the 2011 season. When you return for a fourth year starting, it’s difficult to keep improving and anything but improvement is open to criticism. Barkley hasn’t matched the heights of 2011 so far, but then neither have the USC Trojans as a team. More on him later. He entered the year with possible ambitions to be the #1 pick. Thomas is big, strong and athletic – fitting the criteria of a top-15 pick in the last two years. He spent all off-season working on his game, meeting with experienced coaches to take the next step. It hasn’t happened. He’s regressed and looks awkward, already throwing ten interceptions (his total for 2011) and losing four games at Virginia Tech. Thomas has stated he’ll return for the 2013 season but really, he had no choice. Let’s see if he comes back stronger next year. After a 2011 season where Arkansas pushed the top teams in college football and chased a national title berth, the wheels dramatically came off when Bobby Petrino fell of his motorbike. Soon the Razorbacks were searching for a new coach and the team switched from contender to shambles. Wilson has predictably suffered as a consequence. He missed the 52-0 beat down by Alabama, but called out his team mates after. And just as it looked like things were changing for the better, Arkansas go and lose to Ole Miss on Saturday with Wilson throwing two picks. He’s mobile, he can sling it around – but he doesn’t have ideal height and he gets happy feet sometimes. His throwing motion is also very side arm. Started the year on fire but has since come back down to earth with crushing defeats to Texas Tech and Kansas State. Crowned the Heisman winner and #1 pick a few weeks ago, people are now second guessing just how good he is. Smith could be a first round pick and probably should be a first round pick considering the likes of Christian Ponder and Brandon Weeden have made it in recent years. He’s playing in an extreme spread that favours the arm ball, he can suffer from patchy form and he has a tendency to hold onto the ball too long. He could get back into top-ten consideration if he starts winning again. But right now his stock is trending down after a blistering start. You can see tape of his performance vs Kansas State at the bottom of this blog post. It’s hard to project what the future holds for Barkley, Wilson and Smith (we know Thomas won’t declare). I could see a situation where a team like Dallas shows genuine interest in Wilson – given the inconsistency of Tony Romo, contract status and Jerry Jones’ love for all things Arkansas. That’s a logical fit. But in round one? Smith is the most likely candidate to go early as more of a modern-day prototype (tall, strong arm, mobility) but he needs to rebound after ugly defeats. And then there’s Barkley. I sat down to watch Saturday’s USC @ Arizona game already knowing the outcome and expecting worse than I saw. He wasn’t as awful as perhaps some members of the media suggested, but that’s the kind of review you get as a fourth year senior. The game did start badly though and he should’ve had an interception on the first drive twice. First, he threw straight to a linebacker who kindly tipped the ball into the hands of Marqise Lee. Then he forced a throw down the middle, staring down the route and failing to anticipate the safety cutting it off. It really deserved to be a pick, but the defensive back dropped a gift. Two bad decisions from a quarterback who needs to prove decision making/execution is elite to make up for average physical skills. Ironically, he did throw a pick on the next play and it wasn’t his fault. Barkley throws a little dump off on 3rd and 24 which was tipped into the air by Lee and juggled then caught by the linebacker. It should’ve been caught and it’s funny how the game works sometimes. Barkley is good at moving on from mistakes though. On the next possession he took a play fake, felt the pressure and side stepped the rusher before setting and throwing a dart for a key first down. He’s not a big time athlete who will run away from a big pass rusher, but his footwork is elite. Robert Woods was penalised for pass interference on the call, putting USC at 1st and 30. Barkley went straight back to the pass, launching a bomb down the left hand side to Lee for huge yardage. He got enough height on the ball to let the route develop (the ball came out very quickly) and it was perfect accuracy, right into the hands of the receiver. Yet having got close to the red zone, USC crumbled. They got a bit quirky (Lane Kiffin does that way too often) and having reached 4th and 2, they go for it and miss on a play action pass to the tight end. Barkley had the full back on a checkdown for the first down but perhaps correctly went for the open guy in the end zone. His execution was again poor and he needs to hit that big target. He made up for it with two quick scores shortly after – the first touchdown was a simple dump off on a play action to the tight end. On Barkley’s second touchdown he sits in the pocket, waits for Lee to get open and throws it comfortably over the middle. Lee had enough separation to break off a big YAC run for a 49-yard touchdown. The safety takes a terrible angle which allows the receiver to run it in. Arizona couldn’t cover Lee in the first half. He had 256 yards, 90 coming after the catch. Barkley did a good job finding his #1 receiver, but it was simple pitch and catch for the most part. His first throw of the second half was Barkley at his best – quick drop back, good read and a strike to Robert Woods on a medium slant. He hit Lee on a similar play shortly after for a touchdown, with a big YAC run – taking his production to 299 yards for the day at the time. But then on the next drive he missed a wide open Robert Woods on a deep pass. The defensive back tripped allowing Woods a radius of 20 yards free space. Barkley has to make that completion and push the score to 35-13. Arizona scored on their next drive to make it 28-20 and after a USC fumble, quickly that was closed to 28-26. The rest, as they say, is history. USC’s defense couldn’t get a stop and the offense looked uncharacteristically panicked. Here’s the issue – this was a winnable game. What’s more, it was a winnable game with more than one big mistake by Barkley. When you watch the whole thing you see the defense struggling, the fumble by a running back and the bad play calling from Kiffin. Scouts are going to gloss over that – I guarantee it. They’ll look at two ugly picks, a bad loss and a receiver getting 300+ yards on the day. The negatives are obvious, and the positives justified by Marqise Lee’s incredible day. Suddenly the voice in the war room pipes up. “This guy isn’t physically good enough. He’s just over 6-2, he’s not big or athletic. He’s a timing passer. He had great receivers.” A lot of that isn’t unfair, but it doesn’t do justice to what Barkley is good at. This was an off-day, but people don’t expect you to have off-days as a fourth year senior. They expect you to throw touchdowns, win Heisman’s and National Title’s. Some coaches will be able to see beyond that, but scouts are looking for 1.) big 2.) strong arm 3.) athletic. Luck, Griffin III, Tannehill, Newton, Gabbert, Locker. What do they all have in common? And how does Barkley compare? This is why I cannot call Barkley a top-15 shoe-in. As much as I rate his poise, accuracy, ability in the pocket and yes – appreciation he will have an off-day every once in a while – I don’t think he necessarily fits what the NFL is looking for right now. He won’t get beyond the #20-25 range, but he could certainly fall there. Tyler Wilson and Geno Smith could end up in that range too. But suddenly we’re talking about guys further down the list. And that’s why I think this could be a slightly different draft than previous years. Could it be we have to wait until beyond the top-15 to see a quarterback drafted? It could happen. On the other hand, maybe I’ll be proven wrong? It’s still October and we have a long way to go in this process. But it’s worth considering a draft that could be dominated not by quarterbacks, but by elite pass rushers and defensive lineman. The Seahawks can be a frustrating team to watch. Unbeaten at home, they’ve flirted with winning all of their road games too. It’s that little tease that makes it so hard to take. This one was particularly difficult given it was the defense – not the offense – that was most culpable. In the past it was a strong defense being held back by a stuttering offense. Yet here was Russell Wilson, leading the team and making big plays. Sidney Rice and Zach Miller both scored touchdowns, Golden Tate bounced back after a tough outing in San Francisco. Marshawn Lynch broke off a huge scoring run. The Seahawks scored 24 points – more than enough on the road to get a victory. And here was the defense, unable to get off the field on third down. Detroit converted 12/16 on third down, including the usual issue with 3rd and long rearing it’s ugly head again. Matt Stafford did a good job sensing and avoiding pressure, but he wasn’t completely tested. Richard Sherman backed up his talk (again) and Earl Thomas made a key second half interception but it wasn’t to be. So what’s the issue? The team’s pass rush blows hot and cold too often. Are they relying too much on pressure from the front four? Can that be excused given their investment on the defensive line and the teams schematic desire to rely on pressure up front. After all, it’s helping the linebackers to make plays and the secondary continues to get rave reviews. It’s a pretty obvious thing to do to call for more exotic blitz packages, but when you see Tampa Bay battering Minnesota (Seattle’s next opponents) with lots of pressure, why not indulge that thought? After all, if you’re going to be burned on 3rd and long rushing four, why not get a safety or corner blitzing anyway? I’m not convinced it’s an issue that can be solved via personnel, although this does strengthen the case to consider drafting Alec Ogletree. He’ll add an extra dimension to the pass rush from the linebacker position, while having enough athleticism to adjust and cover if needed. Jason Jones was a big miss among the interior and not having Jaye Howard as a replacement was also key. It’s a strong class for pass rushing defensive tackles if Seattle can’t agree an extension with Jones. The Seahawks can perform better and they need to tweak the scheme a little to execute on third down, but there isn’t an abundance of draft options that will solve this problem immediately. There are positives though. As mentioned, the offense looks better. With every passing week Russell Wilson looks more and more like a quarterback of the future. That’s all you can expect from a rookie – progress. With two homes games on the horizon against Minnesota and New York, they have a shot to be 6-4. That would certainly be progress too – and really the Seahawks as an entity are a bit like a third round rookie themselves. There’s no time-scale on the rebuild and continuing to improve each year has to be acceptable considering where the roster was at the end of the 2010 season. So the sky is not falling this week, as disappointing as the 28-24 defeat was. Bowe has at least 2-3 excellent seasons left at his peak, he’s good in the red zone and we saw in 2010 how effective he can be. If you can work a deal for anything less than a first, I’d do it too. The trade deadline has been moved to Thursday. We’ll see what happens. Wilson could still prove to be a first round pick in 2013 and shouldn’t last deep into the second. The more I watch Dallas’ struggles and knowing Jerry Jones’ background, I wonder if he’ll be the next big hope for the Cowboys? Jarvis Jones missed a couple of games for Georgia recently but his return couldn’t have been any more timely. Jones recorded 13 tackles, three sacks, two forced fumbles and two separate fumble recoveries in a performance which confirms his position as the top prospect in the country. A supreme athlete, Jones was a terror off the edge all day. One criticism has been his lack of big games against ranked opponents, but he dominated the Gators for the second year running. 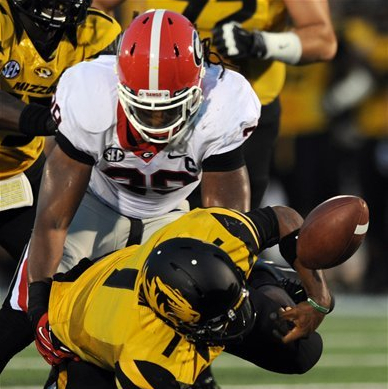 In two games against Florida, Jones has seven sacks. They’ll be glad to see the back of him. Yet this wasn’t all about one guy. Georgia’s 17-9 win was a total defensive effort. Linebacker Alec Ogletree is almost as talented as Jones and was again all over the field. He’s got the athleticism to match-up well in coverage plus the speed to react and sprint to the quarterback as a pass rusher. Not many players have his range or nose for the ball and only off-field concerns will move him out of the top-15. Most people in Seattle want a receiver or another offensive player next April – but be prepared to pine for this guy too. Ogletree is a sensational prospect. He’d be a terror in Seattle’s scheme with his ability to go from 0-60 in a second, his untapped pass rushing potential and ability in coverage. Jonathan Jenkins is an incredibly impressive nose tackle. He has the huge size of a +330lbs lineman but the athleticism of a guy playing 30lbs lighter. He moves so well – even lining up at defensive end for some snaps. Any team looking for a cornerstone pick on a 3-4 defense (this screams Indianapolis) should consider drafting Jenkins. He’s a better prospect than Dontari Poe who went #11 overall this year. 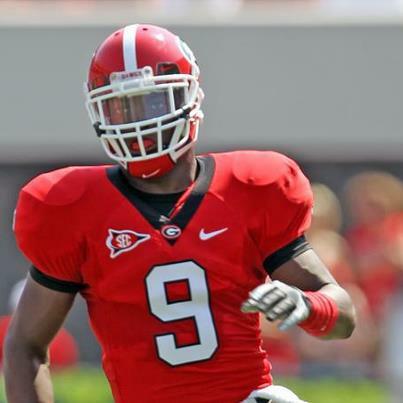 Bacarri Rambo had a pick and a sack and like Ogletree – may provide great value due to off-field problems. Safety Shawn Williams called his team ‘soft’ after three poor games for the unit – he led the charge in the secondary with what can only be described as a ‘legal clothesline’. On fourth down early in the game, Williams shed his block, sprinted from the centre field-to-right and made an aggressive tackle to force a turnover on downs. It was a tremendous play. On the other side, Matt Elam had another great game and justified his place as a potential top-20 pick. He had two impressive tipped passes and showed great strength early in the game to disengage from a block to force a tackle at the LOS. Aaron Murray gifted him an interception and he was always around the ball. Everything Florida did well on defense seemed to have Elam at the heart of things. He’s going to be a high pick. Defense won the day, and so many players in the game will go on to play on Sunday’s. Jones could be the #1 pick next year. Anyone watching the Tennessee vs South Carolina game will understand how upsetting an experience it was. Some NFL pro’s get chance after chance after chance. Some of them don’t deserve that honour, but they keep getting opportunities. It’s used, abused and taken for granted by plenty. Then there’s a guy like Marcus Lattimore. Intelligent, well spoken, a leader and a damn good running back. And after today, we have to hope he’ll get just one chance to play in the NFL. Lattimore suffered a horrific injury, catching his leg between a defender and the turf. For some reason the TV crews kept showing replay after replay of the incident, but it wasn’t pleasant. At first it looked like a clean leg break, but then concerns moved towards a potentially devastating knee injury. Having endured a serious left leg injury last year, to come back and injury your right leg will be incredibly upsetting for Marcus and his family. The one saving grace is he’s the kind of guy that can come back form this. He probably won’t be a high pick in the future (just a year ago he seemed to be a top-15 shoe-in). But he’s got the character to fight back, maybe even at the end of next season. Playing football again may be the first or last thing on his mind tonight. Every football fan will stand shoulder to shoulder with Lattimore as he faces this latest challenge. In terms of the game, Justin Hunter was again mediocre. He failed to catch a jump ball at the death leading to a game ending interception. He dropped two passes. He also made a couple of nice, athletic grabs and ended with eight catches for 90 yards. Even so, no touchdowns again and Zach Rogers ended up being Tyler Bray’s most reliable target. I said it yesterday and stand by it – the guy isn’t ready. He isn’t the kind of player some want you to believe. He needs to return next year – with Bray – and work on a big season. Cordarrelle Patterson was also unable to make his usual big play this week – catching just three passes for 26 yards and rushing three times for 21 yards. When you’re not hitting home runs, you have to find a way to contribute. This is the big issue with Patterson – if he can’t return a kick or break out a big run, are you getting enough from him as a pure receiver? A final note on this one – Dallas Thomas had an incredible game blocking Jadeveon Clowney. He’s another great interior lineman (who can play tackle) to go along with Chance Warmack and Jonathan Cooper. – Rutgers had a disappointing loss to Kent State, but Brandon Coleman had five catches for 51 yards including this score. – Matt Barkley and USC suffered their second loss of the year, falling at Arizona 39-36. I saw snippets of the game and Barkley unusually lacked poise, made two sloppy interceptions and just isn’t playing at the same level he was at the end of 2011. He’s still the #1 quarterback in a mediocre 2013 class, but it’s a game like this that makes me question where he’ll actually fall next April. He ended 31/49 for 493 yards and two touchdowns. I’ll watch this game in full on Tuesday. – North Carolina running back Giovani Bernard might be the most underrated draft prospect in CFB right now. Every week he makes stunning plays. Some of them are pretty unique – like his fumble return for a TD last weekend. Today it was a game winning punt return for 74 yards against NC State with seconds remaining. He also had 135 yards and two touchdowns on the ground, plus a further 95 receiving yards. He could be a first or second round pick. – Speaking of underrated players, it’s time to start taking A.J. McCarron at Alabama seriously. We’ve talked about him a lot on this blog and the guy can play. And don’t doubt his physical tools – as evidenced on this play. He had ‘Bama rolling again at the time of writing – they lead Mississippi State 21-0. He’s still yet to throw an interception this year. Watching a game or a prospect today? Let us know about it in the comments section. Cordarrelle Patterson is a home run hitter. Can he be a consistent NFL receiver? It amazes me that people still rank Tennessee’s Justin Hunter as the best receiver in the 2013 class (for me, it’s Rutgers Brandon Coleman or USC’s Robert Woods). Let’s look at the evidence – this is a guy playing in a pass friendly offense. He has a quarterback that can be erratic at times but does throw a sweet, catchable football. So where’s the production? We’ve seen sloppy dropped passes, an inability to have an impact in big games and just general mediocrity all year. Hunter has two good performances – against Georgia State and Akron. That’s it. He hasn’t scored a touchdown in any of the other five games he’s played this year against the likes of Alabama, Georgia or Florida. It’s OK to talk about potential, but let’s see some real evidence as to why this guy remains a lot of people’s #1 receiver. He’s not a great downfield playmaker. He has a similar frame to A.J. Green but doesn’t run anywhere near the same kind of crisp routes. Green was a fighter – he gave as good as he got in the SEC. Hunter doesn’t have that same physical nature and without great speed and separation, he’s going to need to do a bit of fighting at the next level. The serious knee injury from 2011 can only be an excuse for so long. If he’s not making a big impression in this offense in college, is he really going to step in and be a productive receiver in the NFL? I’m not convinced. Cordarrelle Patterson on the other hand has had an impact, but really only as a home run hitter. He’s not a consistent target and at times quarterback Tyler Bray has been visibly frustrated with the JUCO transfer. Patterson had a glaring drop against Georgia which rubbed out a big touchdown and was largely responsible for an ugly pick six against Akron. In his last four games he has seven catches – so he’s averaging less than two per game. Despite all of that… put the ball in his hands at any point in the game and he’s a threat to score. No other 2013 eligible prospect has Patterson’s playmaking quality. He might not be making a ton of catches, but he is making touchdowns. Kick returns, reverses, rushes from the backfield – he does it all. I’m not sure how the NFL will view this guy. Some scouts will get excited about his playmaking quality and coaches will salivate over finding ways to get him the ball. Some will wonder if he just needs time to mature and pro-level coaching to reach his potential. Others will see Patterson as a gimmick – a nice luxury or project so long as you don’t need to spend a high pick. He’s going to perform well at the combine. He’s a brilliant athlete with elite size and physical tools. If you can manufacture a role for this guy, he could be a star. But can he be coached into that role? Does he want success badly enough and how will he respond to fame and fortune? The best receivers in the league right now don’t get by on just talent alone. You have to work at this. You need to want this. Does Patterson fall into that category? Or is he going to be another diva wide out or a Devin Hester-type with all the incredible physical tools and ability in space but no defined role on offense? The guy intrigues me in so many ways, not all positive. Every fan wants a player like this on their roster who is capable of scoring a touchdown any time they’re on the field. But fans also want consistency and reliability. They want to know if the quarterback throws the ball downfield, you’re going to catch it. Coaches and GM’s are no different. The video below shows what Patterson is capable of, but he needs to finish the season as a more rounded, consistent receiver. No more one or two catch games, please. But keep up the big plays. 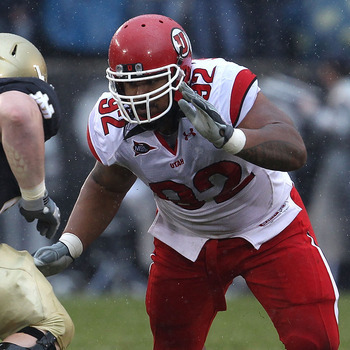 Regular visitors to the blog will know I’m not a big fan of drafting right tackles early. In fact, I hate the idea. Conventional, cliched thinking in the NFL is ‘it all starts up front’. I hate that statement. There are plenty of ways to win in the NFL and it’s not just down to how well your offensive line performs. Super Bowl winners over the last few years have had passable, mediocre or even downright awful offensive lines. Having a great offensive line is just one of the ways to to earn success. Arizona went to a Super Bowl with lousy line play but they had an elite receiver catching passes from a veteran quarterback. Other teams play great defense and run the ball. Many rely on a great quarterback. There are many ways to skin a cat, as they say. However, the ‘starts up front’ talk often falls into the draft. A lot of fans – not just in Seattle – pine for endless draft picks on the offensive line. For some teams this has worked (see: San Francisco) because they drafted well. For others, it hasn’t worked out quite so well. The Seahawks are currently starting two first round picks and a second round pick on their line. If John Moffitt returns to the right guard position, you can add a third round pick to that too. Eventually, you have to back the guys you have and strive for consistency. As a quartet Okung, Carpenter, Unger and Moffitt (or J.R. Sweezy) deserve time to gel. The best athletes are playing defense and it’s going to become more and more of a problem for the NFL. How do you find a guy who’s athletic and strong enough to block Jason Pierre-Paul? Or DeMarcus Ware? Or J.J. Watt? That player doesn’t exist. The guys who can just about do it play left tackle. The rest? They get bumped over to the right. And the guys who can play left tackle usually end up in the top ten of a draft. It’s getting even more of an issue with teams attacking from both ends. A lot of right tackles need constant tight end help or a double team block from the guard. It’s getting so hard for right tackles coping against the leagues elite pass rushers. The Seahawks tried to draft a right tackle in round one. 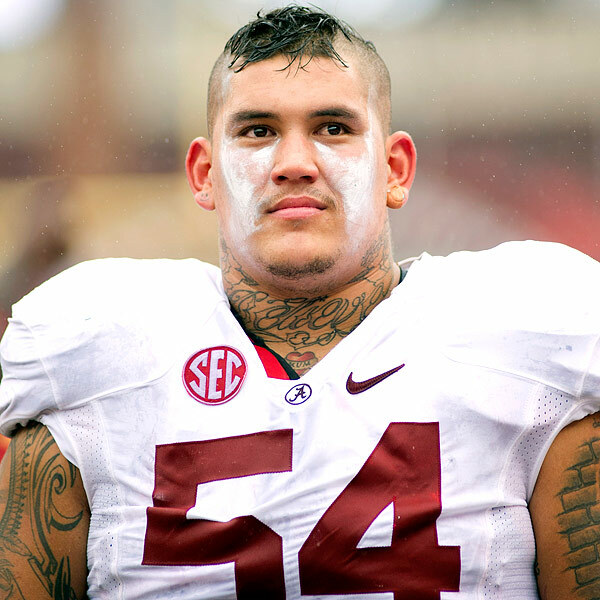 They went out and drafted Alabama’s blind side blocker in James Carpenter – a guy who enjoyed a sensational 2010 season and looked every bit a future franchise left tackle. He struggled on the right and has now been moved inside. There’s a lesson to be learned there as to just how difficult the right tackle position is becoming. Short of drafting a Matt Kalil type and playing him at right tackle, the Seahawks best bet is surely to trust their guys? Give them the time Diehl talks about? The line play hasn’t been amazing in pass protection this year, but it’s improving. The difference between great line play and pretty good is not a new right tackle. Stick by the guys and keep building weapons on the offense for Russell Wilson. This is a draft blog and we won’t ignore the position because of my own personal view, as strongly opposed to drafting a right tackle as I am. Jake Matthews and Luke Joeckel at Texas A&M are two of the better prospects at the tackle position. See below for tape on their performance against LSU last week. Games on the schedule this week: Cincinnati at Louisville, Tennessee at South Carolina, Georgia vs Florida, Notre Dame at Oklahoma and USC at Arizona. I’m particularly looking forward to watching Louisville quarterback Teddy Bridgewater for the first time, while also focusing on the defensive talent in Georgia/Florida, the USC offense against Arizona and just the pure intrigue of the match-up in Notre Dame/Oklahoma. I’ll put an open thread on the blog tomorrow so if you’re watching a game or prospect, tell us about it. This is of course a game featuring DeAndre Hopkins, one of the leading receivers in college football this year. It wouldn’t be a big surprise if the front office was spending a lot of time checking the 2013 wide out class. 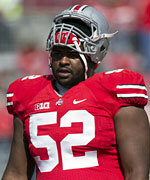 Yet the strength of the 2013 class appears to be leaning strongly towards the defense. I posted an updated top 50 watch list yesterday. Overall it was a pretty even list with 27 total defensive prospects and 23 for the offense – but 14 of the top 20 were defensive players. If the Seahawks do go defense again a linebacker could be on their list of priorities. It seems unlikely they’d go early on the pass rush again considering the production of Chris Clemons and Bruce Irvin, not to mention Clemons’ recent contract extension. The secondary is strong and deep, although you can never have too many good corners. Defensive tackle could be a need if Jason Jones and Alan Branch aren’t re-signed, but that’s to be determined. The other position that could be looked at is the WILL, currently occupied by Leroy Hill. Is it a huge need? Not really, in fact you could probably classify it as a luxury. Hill has the misfortune of simply not being a.) young and b.) K.J. Wright or Bobby Wagner. The Seahawks have two of the best young linebackers in the league and naturally it’s easy to wonder if they’ll go for the hat trick. Last time Seattle had so much invested in the position they were paying Hill, Lofa Tatupu and Aaron Curry over $100m in salary and we all know how that worked out. This is different though – a young, hungry group who are yet to get anywhere close to the kind of money earned by the former trio. Replacing Hill isn’t the difference between Seattle going to the Super Bowl again or settling for mediocrity. In fact, the Seahawks could settle on Hill for a year or two more or simply find a similar replacement in free agency. No team has an all-pro at every position, but as one of the less storied members of the defense it’s easy for fans to point the finger and look for improvement. Lets not forget that Hill was the teams second most productive pass rusher last year with four sacks. Therein lies the issue though – the Seahawks would probably like more production in terms of pressure from the WILL position. Hill hasn’t ever matched his excellent rookie campaign in terms of sacks. Finding a player who can aid Clemons and Irvin while also offering enough athleticism in coverage would be cause for first round investment. As you’ll see below, those types of players are pretty rare. Alec Ogletree at Georgia is the most likely to fit into that role – unless the team gets all quirky and thinks Oregon’s Dion Jordan is athletic enough to play 4-3 linebacker (he’s 6-7). Ogletree is a former safety with the kind of build and athleticism that would make for a justified first round investment. He’s taller than Hill (6-3 vs 6-1) and bigger (235lbs vs 225lbs) but he’s maintained most of the safety speed and gets around the field in coverage. In the video below (second from the top) you’ll see how he lines up in all kinds of different looks and does a pretty good job bringing pressure off the edge and through the middle, while keeping the speed to drop when required and help out at the second level. As a prospect he has so much untapped potential as a pass rusher, it makes him an exciting prospect to look at and imagine in this already loaded defense. There are some concerns too – the multiple team suspensions and lack of off-field discipline completely contrast Ogletree’s on-field demeanour. He’ll have to prove to teams he’s maturing and won’t be a liability with a nice contract in his pocket. He’s also liable to have one or two bad plays per game and needs to remain focused at all times. Apart from that, he has tremendous potential. The other prospect who could potentially play the role is C.J. Mosley at Alabama. He’s similarly quick off the edge and finds ways to make an impact. He’s athletic, he can cover. He also comes without the off-field baggage. None of the other prospects get close to Ogletree or Mosley’s upside as a potential WILL. Manti Te’o should play inside linebacker and I’m tempted to say Arthur Brown should too. The Seahawks could theoretically move Bobby Wagner across – he’s athletic enough to do the job – but he’s playing at a Pro Bowl level inside so why would you move things around if you can avoid it? Brown – described by Pete Carroll as the best linebacker he’d seen in seven years during a recruiting visit – is closer to Hill physically. However, he always looks his best leading the defense from a central position and he hasn’t flashed a tremendous amount of pass rush quality. Either way it’s a good group overall and it’ll provide Seattle with some options if they want to consider drafting a linebacker next April. We’ve done a couple of these before and it’s a good way to discuss rising/falling stock and where prospects may land next April. While it’s still early days in the NFL season, we’re over the midway point in college football. He still hasn’t had that big performance in a key game, perhaps Florida on Sunday will be his opportunity? Jones remains an incredible athlete/pass rusher and he’s worthy of a top-five pick. Perhaps the most NFL-ready non-running back prospect you’ll ever come across. 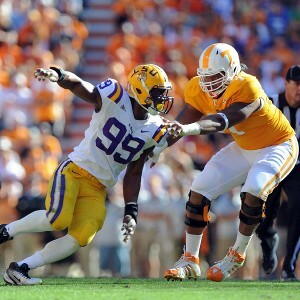 Warmack does it all – powerful in the run game, superb in pass protection and athletic enough to pull and stunt. Day one starter. When you find a 6-6 receiver with Coleman’s frame, speed, catching ability and all-round skill set you have to put him this high. He has the potential to be a superstar. The complete cornerback prospect. Milliner has the recovery speed required to be an elite corner, he’s aggressive against the run and he has ideal size. Oh – and he makes big plays too. The best defensive end prospect in this class, Moore has exploded in the SEC. He fits into most schemes and he leads the NCAA for sacks with 9.5. Still the best quarterback prospect eligible for 2013 and worthy of a grade this high. He’d be an ideal fit for a team like Kansas City, San Francisco, Arizona and yes – Seattle – with a good supporting cast. Lotulelei has unlimited physical upside, he just needs to find a way to play with more consistency. The heart and soul of Missouri’s team. Richardson lives in the backfield and could make an excellent three-technique in the NFL. Celebrated prospect and rightly so. Te’o lacks the extreme athleticism of Luke Kuechly but he makes up for it with bigger plays on the field. A defensive coaches dream. You don’t see many 6-7 pass rush rushers who weigh 240lbs and play coverage. Jordan’s a unique talent. He’s only a notch below Warmack’s potential. Cooper is the most athletic guard I’ve seen and he specialises in pass protection. There are some serious character red flags but Ogletree is a safety/linebacker convert with untapped potential as a pass rusher. Banks is having a great year. The Seahawks will probably like this guy – tall, physical and a turnover machine. I’d like to see him re-gain lost weight from the summer because the player he reminded me of last year was J.J. Watt. Not so much in 2012. I’ve liked this guy for a long time. 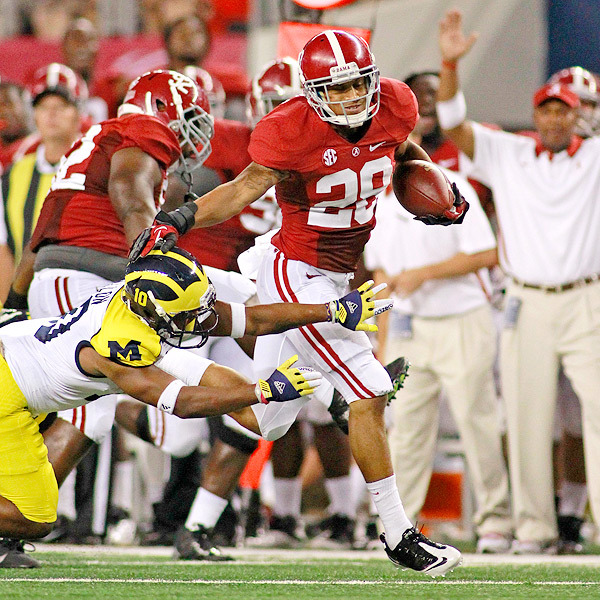 Whenever you watch Alabama he just makes plays. Mosley will have an impact at the next level. 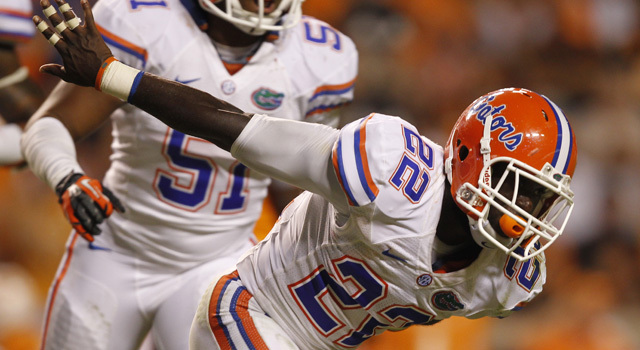 No other safety in college football impacts games like Elam at Florida. He finds ways to get involved and almost always has one big play. Athletic pass rusher who shows flashes of real quality. However, he also drifts in and out of games and hasn’t got amazing production on a good LSU team. He’s not the biggest receiver but he just has a knack of making things happen. Draft him and feed him the ball. He won’t be an orthodox pass-catcher. Age is the only thing preventing Williams from being a top-15 pick. He’s a former JUCO transfer so approaching his mid-20’s. Great pass rushing tackle. Lattimore has done more than enough to restore trust after his serious knee injury. Patient runner, not a burner, but he can be a work horse. Nose tackle prospect who moves so well for a huge man. He’ll anchor a 3-4 defense for years to come and could be a top ten pick due to the value of the position. They moved him to guard this year but he could play tackle at the next level. Tough guy who will succeed in the pro’s. Gun slinger who is suffering due to the turmoil at Arkansas. Height and slingy release is a concern, but not his athleticism or ability to make plays. Not necessarily the franchise left tackle-type that teams are always looking for, but he might be the best of the 2013 bunch. 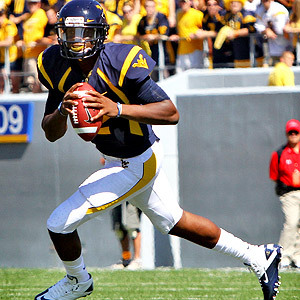 I like Geno Smith, I really do. But there are some issues – he holds onto the ball, the scheme is a prolific spread and he plays in spells. The last two weeks have been ugly. He’s 6-8, 260lbs and makes 20+ yard plays and catches in the end zone. What’s not to like? He’s a flash of lightning – tremendous speed and Austin will be a playmaker as a receiver and a kick returner. Not just a quality linebacker but also a player who is capable of having that Ray Lewis effect as an individual. A leader of men. Effort pass rusher who never gives up. Capable of having the same impact as Ryan Kerrigan in Washington. Nose tackle who relies on strength rather than size. Battering ram type lineman who also plays some snaps at full back in the red zone. Athletically Hankins is the complete package, but he runs hot and cold. At his best he’s a top-15 pick. Not quite as good as advertised as a pass rusher and may be better as an attacking linebacker. More of a natural pass-catcher compared to Toilolo and a more orthodox tight end. Will need to flash at the combine to make the first round. The other tackle at Texas A&M and a solid right tackle prospect at the next level. Lemonier exploded into the new season but has since fallen back into the pack. Definite top-40 value, though. When he’s at his best he looks like a top-20 pick. First round skills and sometimes unstoppable. Hasn’t played well in big games this year. He has tread on the tires but how can you not like this guy? The kind of player you want to root for. Can catch as well as he runs. Big bodied receiver who is relying on the combine to impress. Rejected Alabama to play with his quarterback brother at Cal. He’s shot onto the radar in recent weeks. Can he step up the production and build off some national exposure? He’s having an amazing season, impacting every game and looking every bit a potential top-40 draft pick. Just a solid tackle, unspectacular. Positional value could push him higher up the board come April. Sparky little safety prospect. Looks like the kind of player the Patriots need to add to their secondary. Covers well, gets around the field. The #1 home run hitter eligible for 2013. Will he ever develop into a rounded receiver prospect? That’s the big question. The other pass rusher at FSU not named Bjoern Werner. Both players look superior to the injured Brandon Jenkins. He’s taken big steps this year and is out-shining even Sammy Watkins. Hopkins is rising quickly. I’m not convinced he’ll declare but I really like this Texas defensive tackle who makes a lot of plays. Everyone is aware of Hunter’s potential, but he’s just not bringing it this year. The injured knee from last year can only be an excuse for so long. He’s having a really strong year as a receiver and a blocker. I’m just not convinced he’ll be enough of a difference maker to warrant first round consideration. He could end up rising up the boards very quickly as an athletic blind side blocker. His father used to play for the Seahawks. This will all be about maturity. Can a team trust this guy? Undoubted quality he’s wasting with stupid decisions off the field. Sutton is probably going to transition to 3-4 end but it’s tough to ignore his 2012 season so far – 8.5 sacks playing at tackle. Landry Jones has done nothing in two years of college football to suggest he warrants anything more than a mid-round grade at best. E.J. Manuel is more athlete than accomplished passer, while Aaron Murray has the necessary technique and smarts but lacks the physical qualities to be a high pick. Ryan Nassib at Syracuse looks like a prototype but is inconsistent. And hey – if Syracuse aren’t even going to attempt a forward pass in the first quarter against Connecticut, how good can he truly be? Just a thought. What if the passing game simply needs time? Russell Wilson spent most of training camp splitting reps and competing for the starting job. It’s not the ideal situation to create chemistry with your receivers or get a complete feel for the offense. I don’t have an issue with the competition and think the right man won the gig, but the lack of a complete off-season is probably having some impact in Wilson’s first season. There’s no reason why he won’t gradually start to build that rapport, in fact I think we’ve already started to see evidence of it. Look how well he’s started to find Doug Baldwin on third down as a good example here. He’s working out the strengths and weaknesses of each receiver and he’s making more plays as a consequence. Who’s to say that with further game time and an off-season where he’s the unquestioned starter, that relationship couldn’t develop even further? Most people gave the additions of Sidney Rice and Zach Miller a thumbs up. Golden Tate has shown flashes, aside from Thursday’s horror show. Baldwin is making a promising start to his career even if injuries have hampered his second year so far. It’s unlikely Rice and Miller will survive on their current contracts for 2013, but it’s not impossible for both to remain on the roster. It’s a group that could use at least one solid addition in free agency or the draft, probably two. But it’s not a hopeless group without potential. The running game is working extremely well and Marshawn Lynch is undoubtedly one of the top five running backs in the league. The run blocking is also performing well so far, certainly it’s been superior to the pass protection (which in fairness, has improved a lot in the last three games). The Seahawks really only have one major flaw right now – and that’s the passing game. It’s very easy to sit here and say the front office must go big to improve the skill positions. It’s much harder to be patient and trust the investment made in several key players. The Seahawks haven’t ignored the passing game – quite the opposite in fact. The entire offense has seen a big injection of cash and draft stock, it’s just a shame that the results haven’t matched the outlay so far. Maybe it’ll just take time? The flashes of quality that we have seen (the Patriots game, for example) are cause for such optimism. The big test will be to see whether gradual improvement continues. It’s hard to be too critical when the team faces a defense like San Francisco’s on the road on a short week. Even then mere execution was the issue, not a lack of talent. There are several winnable home games in the second half of the schedule and that’s where we’ll learn how good this offense can be with the current personnel. It may be that the offense does keep improving and that would put Seattle in an ideal drafting scenario. They don’t want to be handcuffed to need in a way they perhaps have been since 2010. If the top three players available in round one next April are defensive players, I’m sure they’d like to keep improving a unit which is earning elite status. I imagine the front office would welcome the opportunity to draft a ‘luxury’ pick like another linebacker, a defensive tackle or even another corner because the offense has stepped up in a big way this year. If we don’t see big improvements as the season continues, we’ll probably end up concentrating on receivers, offensive lineman and maybe even quarterbacks. The point of this piece is really to remind us all that it’s October. A lot can change between now and April and while most assume – myself included – that drafting a receiver or tight end will be the priority. It’s hard to move away from that, but things can change quickly. Alec Ogletree (LB, Georgia) – athletic linebacker and former safety. Incredible range to make plays and owns untapped potential as a pass rusher. Plays inside for the Bulldogs but could move to the WILL in Seattle. Arthur Brown (LB, Kansas State) – ‘heart of the defense’ type of player who loves the game of football. During recruiting at USC, Pete Carroll once referred to this guy as the best linebacker he’d scouted in seven years. 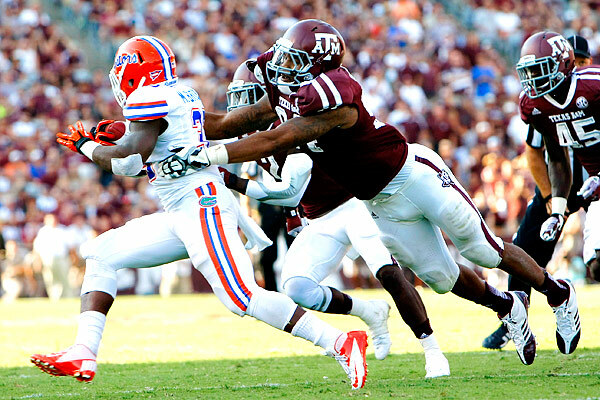 Jonathan Banks (CB, Mississippi State) – Tall, physical corner very much in the mould of Seattle’s current tandem. He’s also a playmaker who forces turnovers. 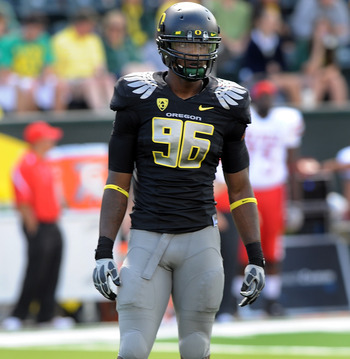 There aren’t many 6-7 pass rushers with the athletic talent of Dion Jordan. I’ve never seen a guy like this before. Usually at that height the movement skills aren’t there, they stick to the defensive line and they carry a lot more weight than 240lbs. Jordan’s size is more traditional for a pass-catching tight end – the position he was expected to play coming out of high school. Yet here he is, seven games into his senior season and with five sacks already. It still amazes me how much he’s in coverage for a guy that big. I doubt it’s something he’ll do that much in the NFL, but it will reassure scouts that want to use him as a 3-4 OLB. The big issue I had coming into the year was really that the most interesting thing about Jordan was the height and athleticism. It’s great being that big and being able to run fast, but you’ve got to show you can rush the passer against some of the weaker opponents on Oregon’s powder puff early schedule. The sack at 0:22 in the video below is what we need to see and Jordan has really polished up his technique as a senior. He’s starting to use his athleticism in a positive way – he’s less of a gimmick these days and looks like he belongs out there. His all-round pressure against Arizona State last week was impressive and in an era where Chandler Jones gets talked into the first round (with a decent start to his NFL career), there’s no doubt in my mind that Jordan will end up being a top-15 pick. He has limitless potential and in the right scheme (imagine him across from DeMarcus Ware in Dallas) he could be a star for the future. 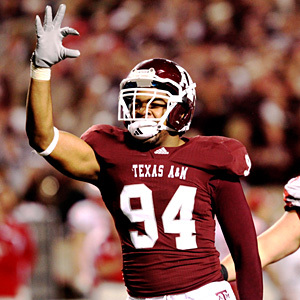 Jordan and Texas A&M’s Damontre Moore are developing into the two premier pass rushers in the 2013 eligible draft class.